For the Allies, bombing had become a mainstay of daily operations over the Western Front with much of the work being undertaken by the FE2b, and 1 1/2 Strutter before superior types such as the DH4 and DH9 entered service. But even as early as 1914 the Admiralty was pressing British designers for a large twin-engined ‘bomb carrier’ for overseas patrol duties. It was Handley Page Ltd., who revised their pre-war trans-Atlantic design to develop the O/100 bomber which made its initial flight in December 1915. The big aeroplane was a success and when powered by Rolls Royce Eagle VIII engines, the O/400 began following the O/100 into service during 1917. Handley Page bombers served with distinction in the Independent Force under Major General Sir Hugh Trenchard, having been formed in June 1918 largely as the result of the 1917 Gotha raids. 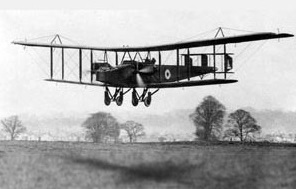 Handley Pages had been carrying out successful night bombing operations since October 1917 and this continued up until the closing stages of World War One. The bomber concept had been proven and in a second world-wide conflict would emerge as one of the incisive instruments of victory.